TickleMe Plant Greenhouse garden kit with science activity card to (Grow the only House Plant that closes its leaves and lowers it branches when you Tickle It!) Great Unique Birthday Gift Idea! Huge Savings Item! Save 18% on the TickleMe Plant Greenhouse garden kit with science activity card to (Grow the only House Plant that closes its leaves and lowers it branches when you Tickle It!) Great Unique Birthday Gift Idea! by TickleMe Plant at Aquaponics In Paradise. MPN: TFG6. Hurry! Limited time offer. Offer valid only while supplies last. This touch sensitive plant moves when you tickle it. Even the branches of this amazing plant move down when touched. Kids and adults will love this. EVERYTHING YOU NEED TO GROW THE HOUSEPLANT THAT REALLY MOVES when you Tickle it! TICKLE THIS VERY SENSITIVE PLANT and the leaves close! Even the branches droop! EASY TO GROW INDOORS - Even in WINTER! Guaranteed to MOVE When TICKLED! INCLUDES TEN FUN ACTIVITIES to do with your Pet TIckleMe Plant! Manufacturer: TickleMe Plant Company, Inc. Publisher: TickleMe Plant Company, Inc. 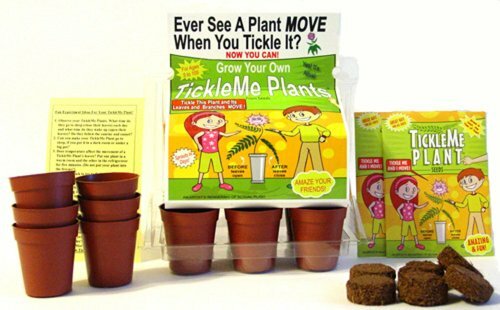 Studio: TickleMe Plant Company, Inc.
View More In Germination Kits. If you have any questions about this product by TickleMe Plant, contact us by completing and submitting the form below. If you are looking for a specif part number, please include it with your message. Seed Starting Kit – Complete Supplies – 3 Mini Greenhouse Trays with Dome fits on Windowsill, Fiber Soil Pods, Detailed Instructions. Indoor/Outdoor Gardening. Grow Herbs, Flowers and Vegetables. Active Aqua Chiller Fitting Kit for AACH25 and AACH50, 3/4"